WE GOT BIKES. Okay, okay, not so loud. We got bikes. We are now actual homeys. Or is it homies. A Dutchman without his bike isnt a Dutchman, and he knows it. The Netherlands has more bicycles per capita than anywhere else on earth except China. Thats what it says in the books and anecdotal evidence suggests that its true. Everyone rides a bike. On the Saturday night after Thanksgiving, we went to someones home for dinner and an expatriate American woman, late 40s and been here for more than 30 years, was a guest. In 30 years, she had become Dutchified. She was all dressed up in high heels, a long skirt and a just so hat. She left on her bike close to midnight for the three mile trip home. We see young mothers with not one, not two, but three kids mounted on a bike along with a load of groceries. There was a guy riding his bike while reading a book. There was a woman balancing a box that appeared to be a small television between the handle bars and her lap. Another guy was carrying a piece of plate glass under his arm and someone else had a hold on a fifteen foot pole. All on bikes! Octogenarians are pedaling around. My favorite, though, was an old guy who had a holster mounted on his front wheel to hold his cane. This dude couldnt walk but he could ride his bike. You gotta love a guy like that! The bikes come in a variety of styles that you wouldnt see in the U.S. There are hardly any racing bikes, the ones with the dropped handle bars, but what they do with the upright handle bars is surprising. Some have very small front wheels so that a crate is permanently affixed. These crates are loaded with groceries, kids, and dogs. Most of the bikes are clunkers. The clunkier the better. People ride bikes in all kinds of weather, and it rains a lot here, so a new bike will turn into a clunker pretty soon anyway. The bike I rode at home had no fenders so it would throw water in wet weather making an "I" on the back of the rider and it had no chain guard which added weight. Here, every bike has fenders and a chain guard. The chain guard keeps your pant legs from getting grease on them. At home it was just my bare legs getting greasy and I had to take a shower after riding anyway so who cared? Bicycles are a basic mode of transportation even in Den Haag and Amsterdam, two large cities. Every street has bike lanes clearly marked. If a car has to cross a bike lane to make a right turn, the driver has to be very careful that he doesnt interfere with the movement of the biker. If anything happens between a car and a bike, its the driver of the car thats at fault and this is common knowledge. Unlike at home where bikes are, at best, a tolerated nuisance and at worst, something to take aim at, here they are fully integrated into traffic and into society. A lot of the reason for the extensive bicycle usage is probably because the terrain here is so flat and its easy to pedal. One need not have legs of steel or even a Clydesdale horse. But the sheer number of bikes can be the scariest thing for a biker. A bike riders paradise might be something like Fairmount Park on a weekday morning. Its quiet, not too much traffic, and you can enjoy all the surroundings. This isnt that. Delft is a small town, maybe about two miles square and its dense. Theres old Delft and new Delft. New Delft has been around, Im guessing, since maybe the 18th century and has broad streets and trams. 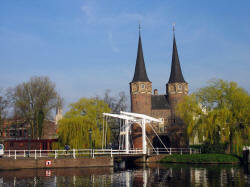 Old Delft has been around since about the 11th century. It gives an American a different perspective on "old." We saw in a book that Delft means moat in Dutch and the old town is pretty much surrounded by a moat. There is some automobile traffic in the old town (and even some city busses  that is a sight to see) but mostly its pedestrians and bikes. The good thing with cars is that they move generally in single file. Bikes come from all directions and at varying speeds. If one is a little unsteady on a bike, it can be unnerving. Also, because the town is so old, there are alleys everywhere. People come out of the alleys without paying any attention to whether or not there are any pedestrians, bikes, or even cars approaching. With cars, though, it doesnt matter, because if you get racked up on the bike, at least its the drivers fault. Maybe you could sue. This may not be a bikers paradise but its damn close. So I have to get out of here. Im going grocery shopping with my bike and my backpack!